Dentibrite Cleaning Crystals for Retainers & Aligners - NEW! Introducing dentibrite™ triple action cleaning crystals, an easy and fast way to clean your retainer or aligner. Dentibrite uses a patented formula that kills 99.99% of germs and odor causing bacteria. It removes stains and plaque build-up, and it's persulfate-free and dye-free. And, it's made right here in the USA! 1. Place your dental appliance into a clean container, such as a glass or cup. Add just enough warm water to cover your dental device. 2. Tear open one packet of dentibrite cleaning crystals and pour the contents into the cup or container. Soak your dental appliance for 5 minutes in the dentibrite solution. 3. After soaking for 5 minutes, rinse your dental device in clean running water. Discard the used dentibrite solution. 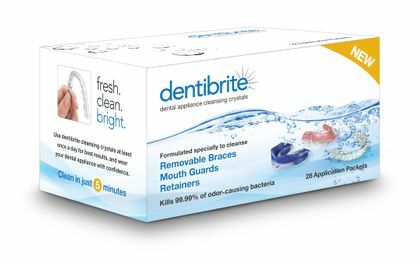 Each box of dentibrite contains 28 packets of cleaning crystals. Use it every day to keep your retainer or aligner clean, minty fresh and odor-free. Dentibrite is designed to gently but effectively clean clear braces, retainers, mouth guards, dentures and similar removable appliances without causing damage. What really sets dentibrite apart is the advanced science behind its patented formula, which includes efficacious, rigorously lab-tested ingredients without persulfates or dyes. Need a soaking container? Try our mighty little battery-operated Sonic Cleaner! This portable device is only 4 inches square, but delivers an impressive 5800 waves per second, deep cleaning where brushes can't reach. The Sonic Cleaner is sold separately. Each box of dentibrite contains 28 packets of cleaning crystals. Use it every day to keep your retainer or aligner clean, minty fresh and odor-free. Dentibrite is a new cleaning solution for retainers, aligners, and other removable dental appliances. We like the way it's packaged, in convenient individual-use packets. It works fast and does a good job ridding a retainer of plaque and bacteria. We're sure that you'll love this new product! How does Dentibrite compare to Dentasoak? Although the names are similar, the two products are made by different companies, and they work differently. Dentibrite comprises one packet of crystals that you mix with warm water. Each packet is single-use. Your retainers are clean after 5 minutes of soaking. It does not contain persulfate. It will remove heavy plaque in 3 to 4 cleanings. DentaSoak comprises one packet of powder and one packet of liquid that you mix with cold/cool water and can be used for up to one week. After one week the mixture should be discarded. Your retainers are clean after 15 to 20 minutes of soaking. It does not contain persulfate. It will remove heavy plaque in 3 to 4 cleanings. Love how this leaves my bite guards so clean. I tried toothpaste and Listerine, which does an okay job, but I can definitely feel the difference when I use Dentibrite ans so easy to use. Highly recommend. ProsSo easy. Just drop in warm water and leave for 5 minutes. Works very well with the sonic cleaner! Cleans my Invisalign retainers very well. Works best if you use it every day. The Dentibrite I received in the mail from DentaKit was fresh and didn't blister while still in its packaging. It works great and smells fresh. DentaKit is the Real Deal. Thank you for selling direct and giving customers a way to avoid counterfeit fraud and worse. Originally, I made the mistake of ordering this on Amazon. On Amazon, who knows what they put in their product? I thought it was legit. Turns out Amazon sells counterfeit and expired products. The bogus ripoff product sold by "Teeth n Things" on Amazon was complete garbage and they refused to refund my money when I returned their fake counterfeit product. They claimed that Dentibrite had "changed their formula" when I complained. Amazon should be shut down for the organized crime that it is. Just saying. ConsAmazon should NOT be allowed to sell counterfeit versions! Gotta love the short cleaning time. With warm water and five minutes my retainers are fresh and clean. The Dentibrite Cleaning Crystals work great on my Invisalign aligners. The individual packets are convenient when traveling. No more leaking bottles to deal with when flying! I bought it specifically because the crystals are persulfate free & dye free. ProsNo leaking travel bottles to deal with. Convenient individual packets. I like the feels of clean invisilyn retainers. I must wash off the dentibrite cleaning solution but the braces stay fresh for a few weeks rather than days. ConsI must wash off the denticlean and make sure all taste is gone before inserting. The 5 minute cleaning time is great and my retainer is as clean as with the longer process. Wonderful new product that I will keep using. I really appreciate you offering this product. I've been using DentiBrite now for a few weeks and I'm very pleased with the way it cleans my retainers. Thank you so much! Cleans my retainers fast. Does a good job. I plan to take them on my upcoming vacation trip. Works really great to clean my retainers fast. I will definitely buy it again. Thank you!